Written by guest blogger and sponsored rider Rebecca Page. I am a 21-year-old event rider from Cambridge and I’ve been working with Helen almost 3 years now. Helen is such a valuable member of my team, I don’t think I could do it without her! I originally approached Helen at the start of 2015 when I had a confidence issue with show jumping. 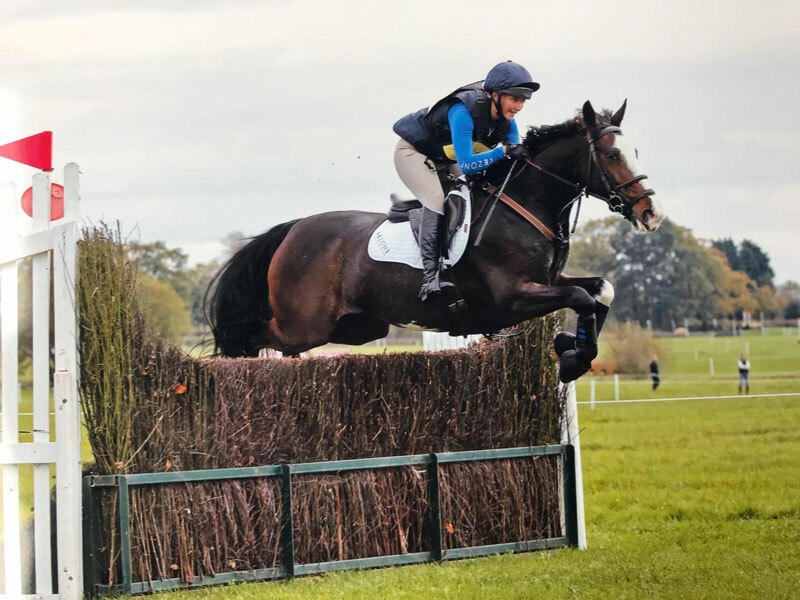 It wasn’t that I was scared of the fences, more that I would worry about seeing a stride, then I would panic and basically sit there like a lemon doing nothing, resulting in a fair few fences down, clear rounds were few and far between. I must admit, I was extremely sceptical and wasn’t quite sure how speaking to someone over the phone and through Skype calls was going to dramatically change my performance… How wrong I was!! Helen has this very weird yet magical way of getting inside your head, in a way that not your trainers, friends even parents can, she manages to unlock things that you didn’t even know were bothering you, they are that deep in your subconscious mind, but Helen finds and solves them! I found the techniques Helen taught me really helpful for improving my performance, particularly mental rehearsal. Helen would get me to picture all the good jumps I have had and the feeling it gave me, also picturing how I want my round to look like and how I want to ride the fences once I have walked the course, this was great for me as I have such a vivid imagination. She also gave me breathing techniques to keep myself as calm as possible before going into the ring. My biggest thing would be not seeing a good shot to a warm up fence and then just panicking resulting in not the best round in the ring. The techniques such as breathing and positive mantras, which I learnt from Helen, helped me in these situations. After sessions with Helen my show jumping not only got easier for me but clear rounds became more of a norm and we got many top ten placings at novice level throughout the 2015/16 event season, even managed a double clear at the prestigious event Houghton where I was competing in the CCI1*. This season hasn’t been great for me with horse injuries, the quirkiness of young horses and getting to know new horses however it has given me an opportunity to work more on my mindset with Helen. I am a perfectionist, I have very high expectations, not to win but just to do the best that I can and bring the best out in my horses. I find I really beat myself up if I feel like I have let my horses down. This season with the help of Helen I have managed to actually see a positive from my mistakes, Helen has got me to see things from a very different perspective. My favourite term used by Helen is “it is just data analysis, you are going to collect data to then bring back, analyse and work on” I honestly live by this. Now when I make a mistake I see it as an opportunity to improve and get stronger in this area. It’s also a great term to use when taking the young horses out or a new horse I am just starting a partnership with. This actually turned out to be a really good way to subconsciously keep my nerves at the minimum, because actually it made me worry less about the end result and focus more on just seeing where both me and the horse were at, at this stage in their training. This in itself improved my results because I was just riding as if I was at home or out schooling! Its really strange how the mind works! Overall this season I have had a very positive outlook on everything I have done. I have managed to take a positive away from any difficult situation and looked at every difficult situation with a healthy attitude, such as what can I take from that to make better. I feel I have mentally matured and that whatever is thrown at me, with the help of Helen of course, I can overcome it. And see the light of what, in the horsey world, can be at the end of a very long dark tunnel.